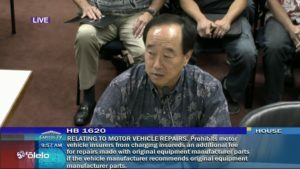 Hawaiian Insurance Commissioner Gordon Ito declared last week that his office couldn’t see any “obvious benefit to consumers” in a bill that would prevent Hawaiians from having to go out-of-pocket for OEM parts in instances where the manufacturer recommends them. Ito said that consumers were adequately protected under a Hawaiian law declaring that insurers must use certified parts “if available” of “equal or better quality than the original equipment manufacturer” for any part not required to be OEM under a warranty. The law also declares that consumers must pay the difference if they want any other OEM parts. By definition, House Bill 1620 and its companion Senate Bill 2243 grants consumers two benefits: It declares OEM parts must be an option in all instances where an OEM recommends them, and it changes the law to state that consumers won’t have to pay out-of-pocket for choosing such parts under those circumstances. 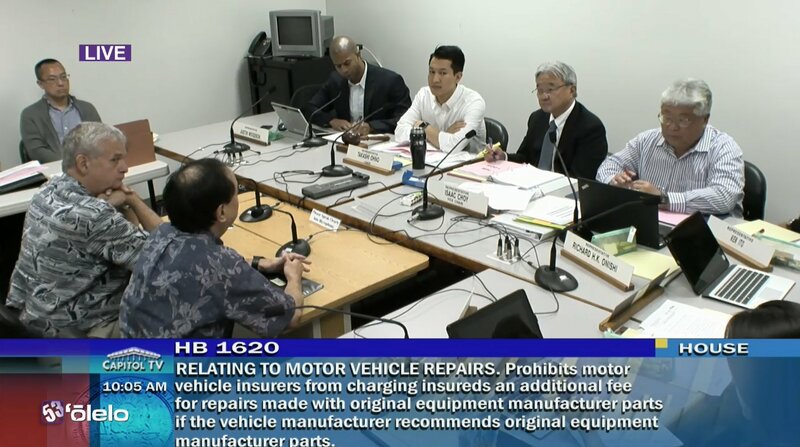 It should be a little disheartening to Hawaiian consumers that their insurance commissioner — whose office falls under Department of Commerce and Consumer Affairs agency — is so blase about consumer and auto body shops’ views that this bill would benefit vehicle owners. He also seems to regurgitate insurer talking points — more cars will total, premiums will increase — without presenting any real actual data. Let’s look at Ito’s arguments and some of the issues with them. Shipping to Ito’s office ZIP Code 96813 cost at a minimum $283.99 and was slated to get there in 5-6 business days. No DHL option was available. So the difference would only be $66.67 between the two parts under the conditions we encountered. The DHL option obviously appeared for whatever ZIP Code Ito used, and for all we know will be available tomorrow; our point is that apparent fluctuations in the market might reduce the savings far lower than his example suggests. Ito’s more extreme example of an aftermarket part being 63.5-66.7 percent cheaper than the OEM version also offers lawmakers a distorted picture of the spread. Aftermarket parts advocacy group the Quality Parts Coalition has most recently argued that the typical aftermarket part costs 26 to 50 percent less than OEM, with an average savings of 29 percent for a sample of CAPA-certified parts sold between 2009-14. The National Association of Mutual Insurance Companies cited in its opposition of HB 1620 what appears to be a 1999 study by the Alliance of American Insurers which PropertyandCasualty.com reported found aftermarket parts to be 60 percent cheaper. A 1999 vehicle is dramatically different than one today, so the QPC/CAPA version is probably a stronger data set. But either way, Ito is presenting lawmakers an example beyond what even insurers and parts advocates’ data suggests. “I think the policy decision is whether you’re going to require increased costs across the board to pay for repairs of original equipment or we’re going to keep the law as currently provides,” he told the committee. However, there’s some counterarguments to his higher-premium argument. The incorporation of aftermarket, recycled and remanufactured parts into estimates doesn’t mean insurers won’t raise rates anyway. Insurers increased Hawaiian collision rates in 2014 and 2015, the last two years for which data is available from the National Association of Insurance Commissioners. Though rates had dropped below 2011 levels in 2012 and 2013, the increase in 2014 boosted the average collision insurance cost back above that 2011 mark. Ito observed at the Jan. 31 hearing that requests to increase rates “are starting,” attributing this in part to increased costs from more advanced vehicles. 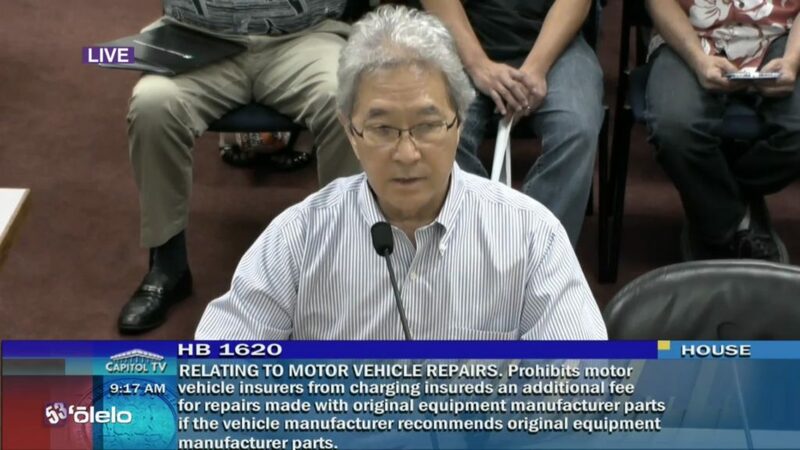 Automotive Body and Painting Association board member Van Takemoto (Island Fender) doubted the prediction of increased premiums at the Jan. 31 committee hearing. Other predictions of whopping price increases related to OEM parts turn out to be less impressive under scrutiny. 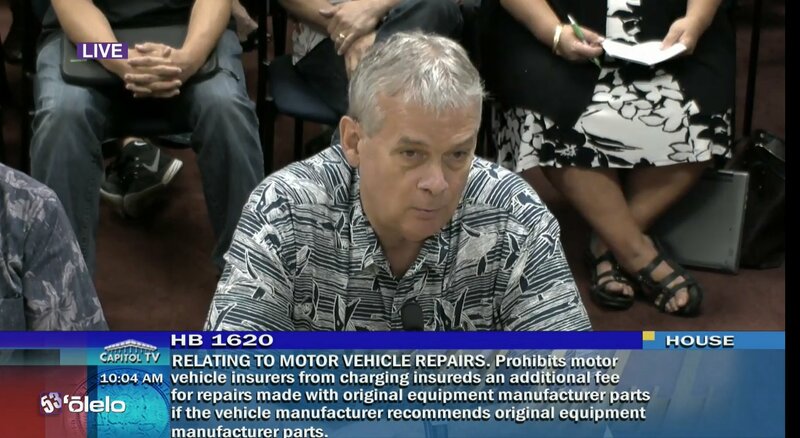 According to Dayton, part of the issue surrounded a 25 percent markup over MSRP he said occurred on parts in Hawaii. He argued that that if lawmakers passed HB 1620, they should ban such a markup by parts vendors to offset it. Under Dayton’s prediction, consumers would certainly feel the difference. The average 2015 combined premium (liability, collision and comprehensive) was $1,009.38, and the average Hawaiian combined premium was $873.28. However, the NAMIC cited to lawmakers 2013 Property Casualty Insurers Association of America data that the average insurance property damage premium would rise far less. The PCIAA reported the average property damage-related premium would increase 3.6 percent and the average combined property and liability premium would grow 2 percent were aftermarket parts banned. The Quality Parts Coalition also promotes this assessment on its website. That’s a far lower increase, and perhaps not a deal-breaker for a consumer considering the safety, fit and corrosion issues OEMs and repairers have raised on aftermarket parts. Using the average combined 2015 premium, the average American with liability, collision and comprehensive insurance would pay about $20.19 more a year. The average Hawaiian would pay about $17.47 more a year. Ito also ignores that Hawaii’s insurers came out ahead in 2016, the last year for which NAIC profitability data is available — and spent so little on actual customer vehicles that they could use more than 10 percent of premium dollars to sell insurance. Auto physical damage insurers in Hawaii only spent 61.4 cents out of every premium dollar on actual loss costs. Another 8.5 cents went to loss adjustment expenses like the lawyers and adjusters handling the claims. But insurers spent 13.1 cents on marketing and ultimately came out up with 5.6 cents in profit after factoring in variables like taxes and investments. So there’s room for insurers to absorb that 2-10 percent increase, and according to Takemoto, some Hawaiian carriers already are doing so without destroying their business. Takemoto also pointed out that only a few parts would switch from aftermarket to OEM, another point against Ito and insurers’ contention that premiums would skyrocket and more vehicles would be totaled. About 3.17 parts on the average estimate were recycled, aftermarket or remanufactured in the third quarter of 2017, according to Mitchell’s most recent Industry Trends Report data. The average third-quarter estimate was projected to be about $3,043. Start putting this data together, and you find that the average estimate would have had about $471.38 worth of alternative parts. Plug in CAPA’s assessment that its certified non-OEM parts are 29 percent cheaper than OEM, and our hypothetical insurer or vehicle owner would be paying about $192.54 more were all parts OEM. It’s difficult to see how $192.54 — or even $471.38, using the QPC’s 50 percent upper end — is the only thing standing between a vehicle being declared a total loss. The average repaired vehicle in the third quarter carried a cash value of $14,639, Mitchell reported. Be heard: Hawaii legislator contact information can be found here. Correction: An earlier version of this story incorrectly characterized insurer advertising as a proportion of premium dollars. The NAIC classifies the statistic as “Selling Expenses,” which can mean expenses like agents as well as advertising. The article has since been corrected to reflect this.